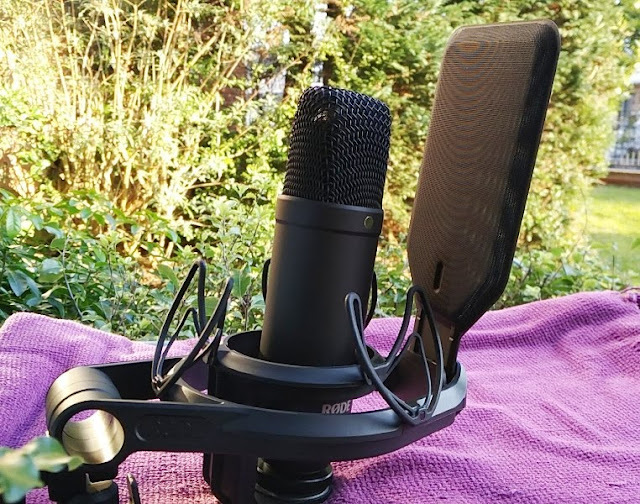 To be a record producer or songwriter, you don't need a professional studio! 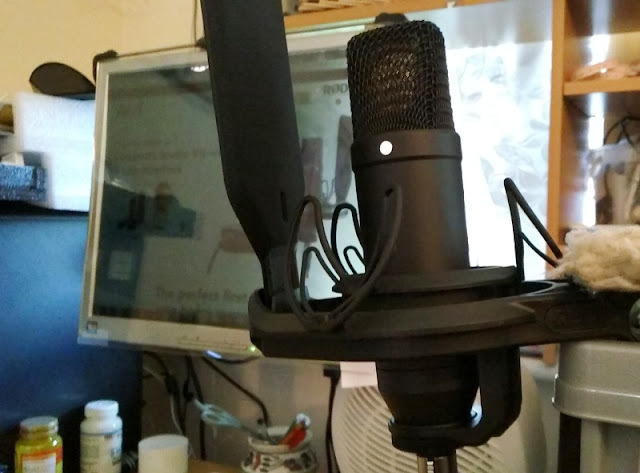 Just ask Jeff Lynne, Joe Meek and other famous people who recorded music in their homes! 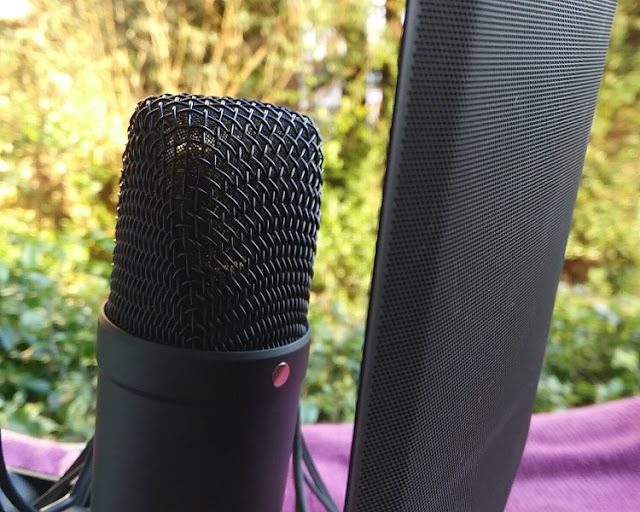 Many many top albums of all time have been recorded in bedrooms, kitchens, garages, basements and even beds by top artists like David Gray (White Ladder album), Liam Howlett (Always Outnumbered, Never Outgunned album) and Adam Young (Of June album) who recorded their albums in their house. 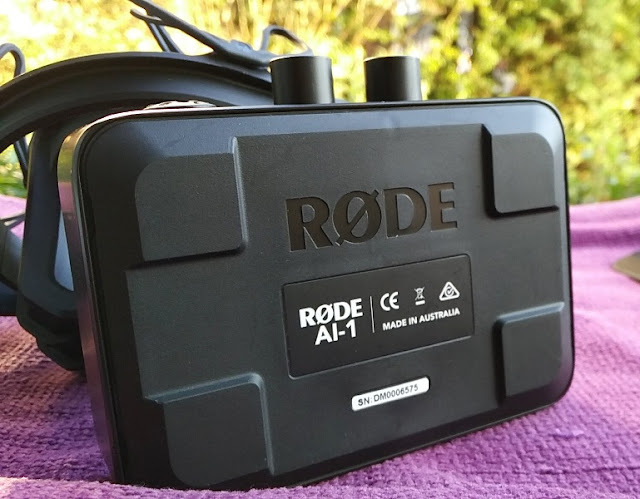 As I understand, Adam Young recorded his album in his parent's basement home, while Liam Howlett recorded his in his bed! 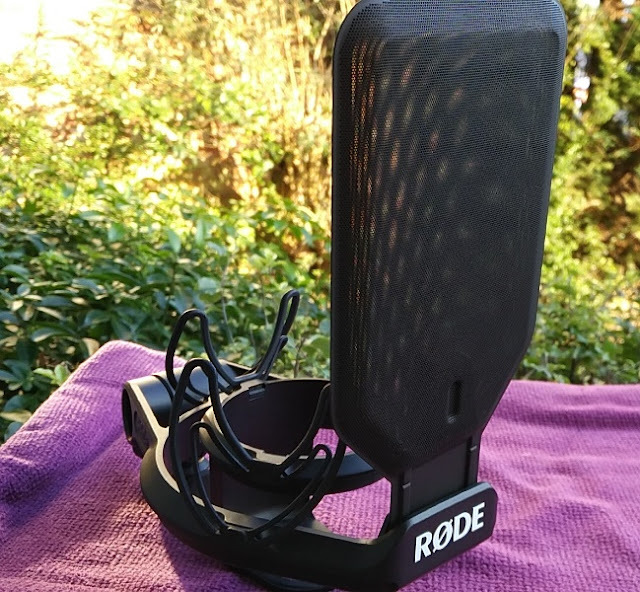 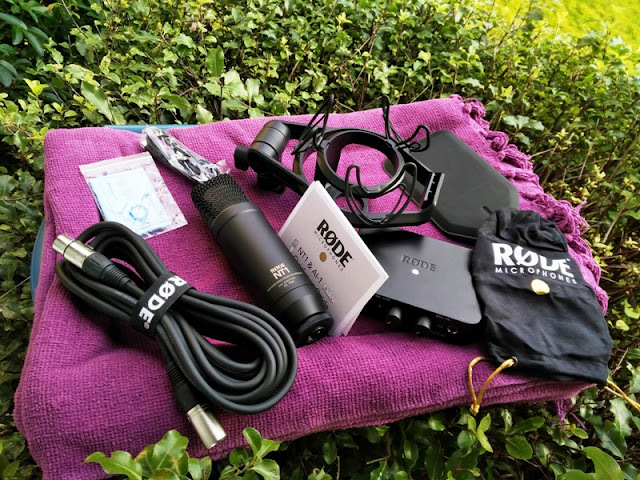 The Rode home recording bundle consists of an assortment of Rode branded products that include the AI-1 audio interface, the NT1 microphone, Rode metal pop filter, Rode SMR shockmount and Rode XLR cable. 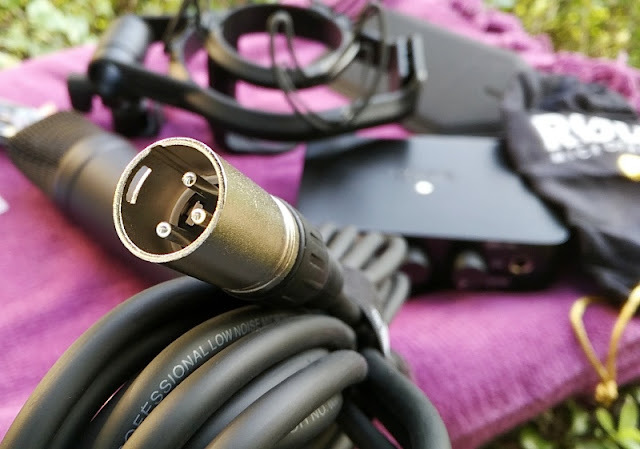 The AI-1 is a USB bus-powered via USB-C/USB3 single channel preamp audio interface for a single microphone setup that allows you to record at 24-bit up to 96 kilohertz (kHz) down to 88.2 kHz and 48 kHz. 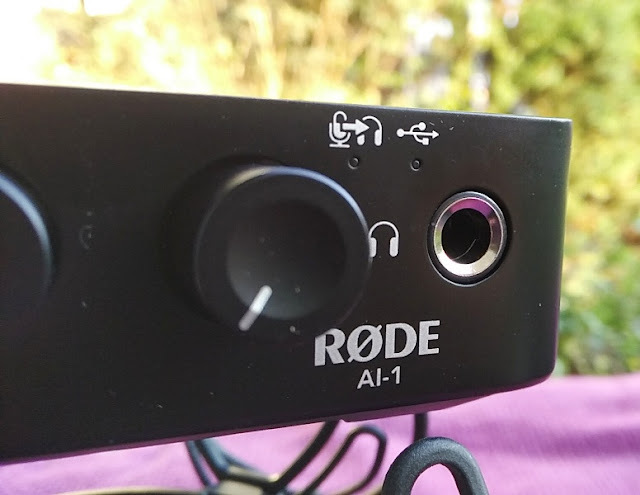 The AI-1is a 1 x 2 simultaneous audio interface designed to plug into a condenser microphone or electric instrument and act as an interface to a computer to convert the analog input sounds for your computer to process and play back digitally. 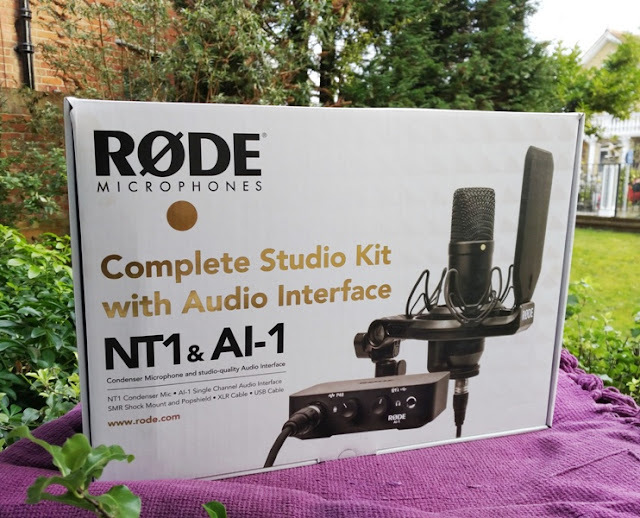 The NT1 condenser microphone and electric instruments require 48-volt phantom power to work so the integrated preamp in the AI-1 interface provides it. 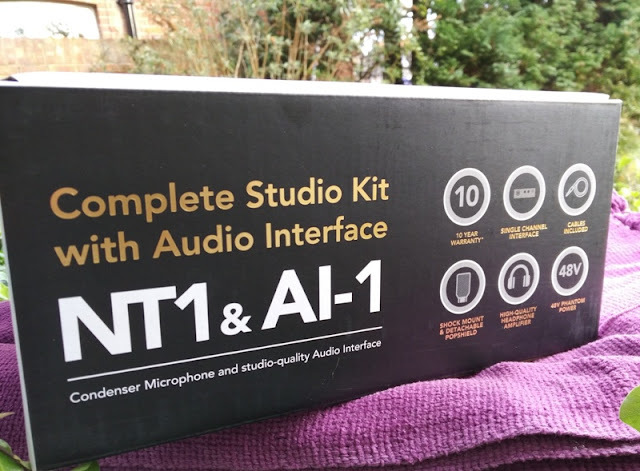 The AI-1 audio interface has an all metal body that weighs 558 grams and measures 8.8cm deep (with 10cm knobs), 12.4cm wide and 3.8 cm high. 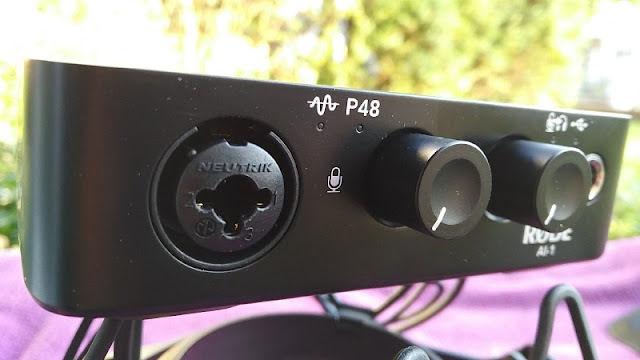 On the front of the AI-1 audio interface, you find a Neutrik XLR-1/4” combo for inserting a XLR male connector and/or 6.35mm (1/4 inch ) jack. 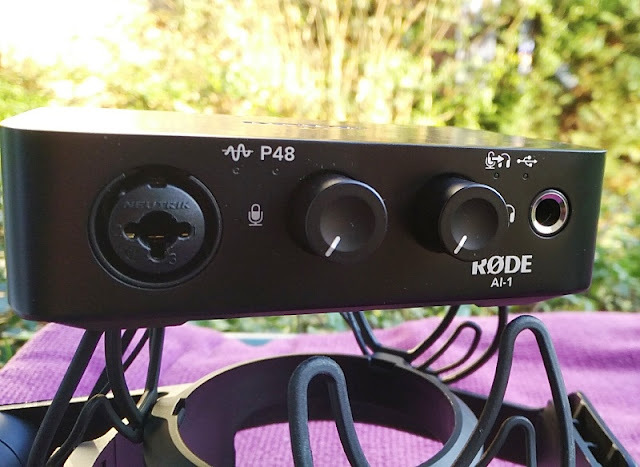 The knob on the left is both a knob and a button for controlling the gain (from 0dB to 45dB) and phantom power (by pressing the knob). 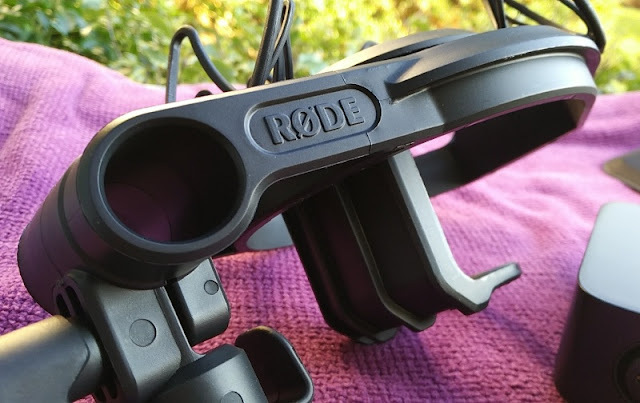 You can turn the knob left to right to adjust the gain or output signal of the microphone. 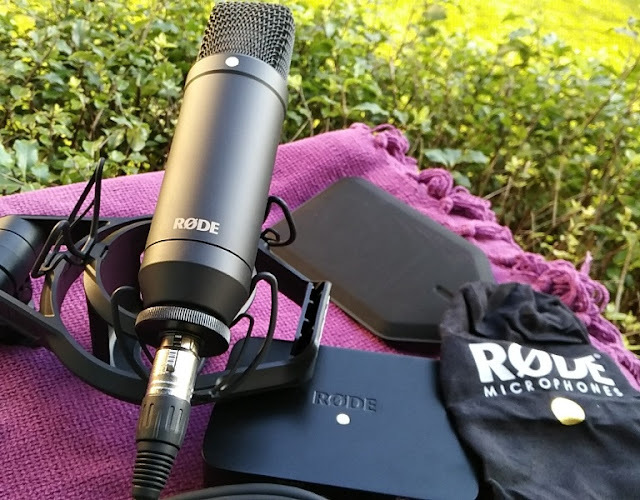 The gain feature is great as it lets you boost the gain of a microphone with very low output signal to get a better level into AI-1 audio interface. 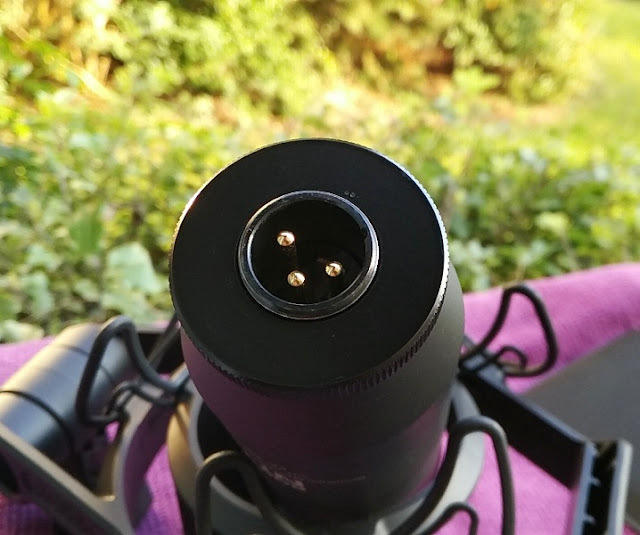 Just left to the left knob, you find two small LEDs, which are the signal light LED and phantom power LED . 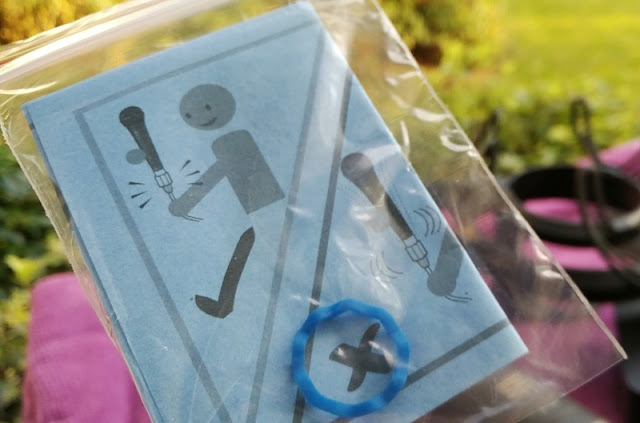 The signal light LED lights up yellow (when the signal is at negative 12 decibels), or lights up red when the signal is hitting negative 3 decibels. The LED with the words P48 is the 48-volt phantom power LED light. 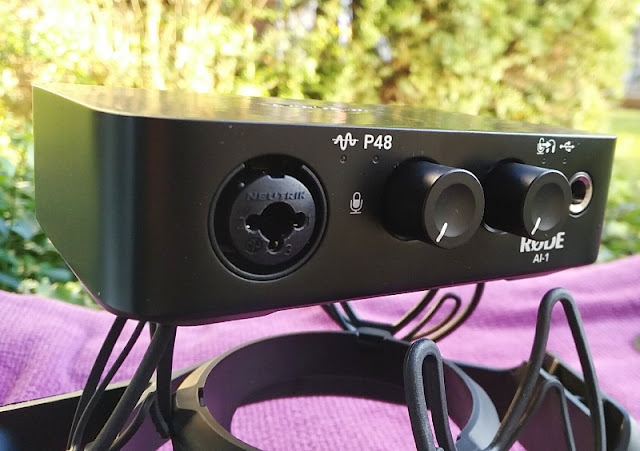 When the 48-volt phantom power is turned off, the AI-1 interface uses +24V phantom power by default. 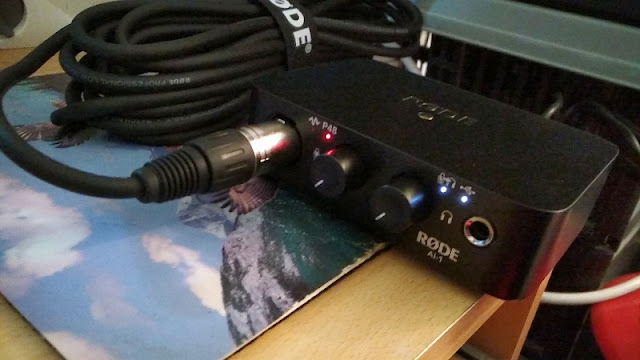 output and two small LEDs on top. 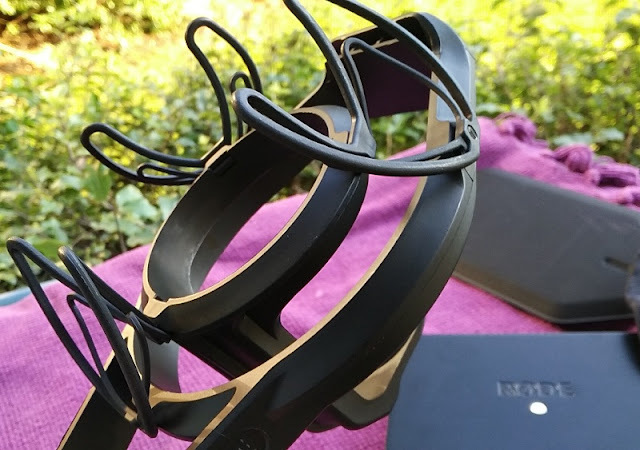 The LED on the left lets you know if zero latency monitoring is on or off, while the other LED with a USB symbol is the USB power light that lets you know the AI-1 audio interface is powered and working. 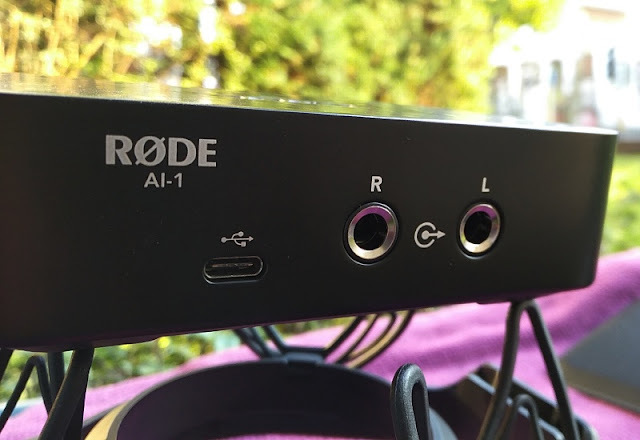 On the back of the AI-1 audio interface, you find a USB-C port as well as Left and Right speaker output sockets. 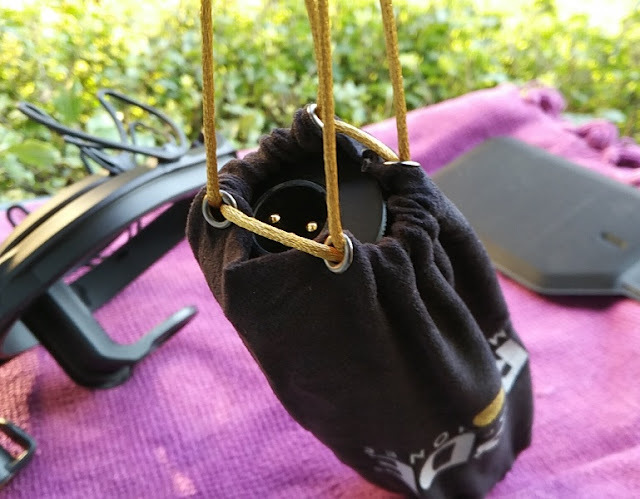 When you have your headphones plugged into the AI-1 interface, the left and right speaker outputs get muted automatically. 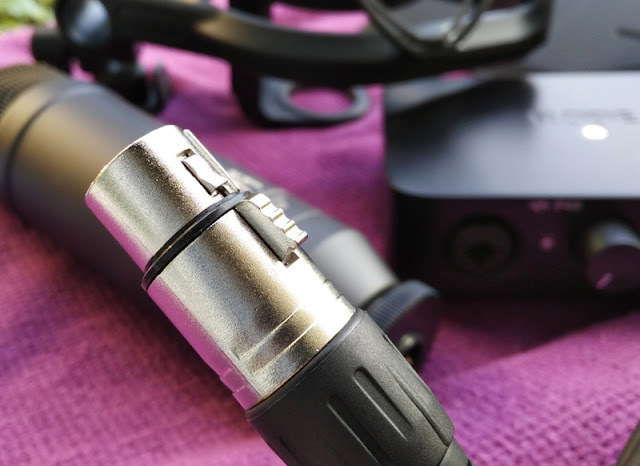 The XLR/MIC input has a frequency response range between 20Hz and 20kHz with a high input impedance of 1.3k Ohms and input noise of –128dBA. 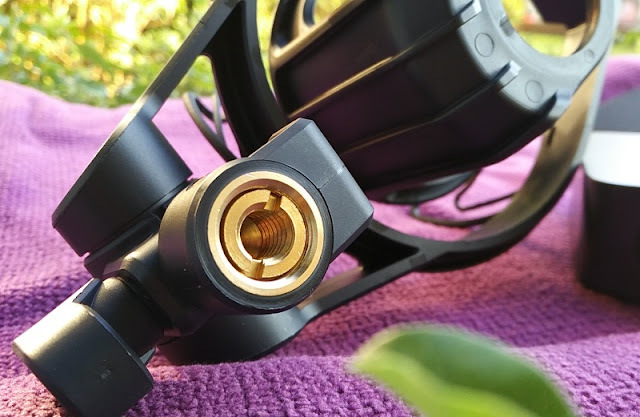 The quater-inch (1/4) input has a frequency response between 20Hz and 20kHz with a gain range between 0dB and 45dB and an input impedance of 900k Ohms. 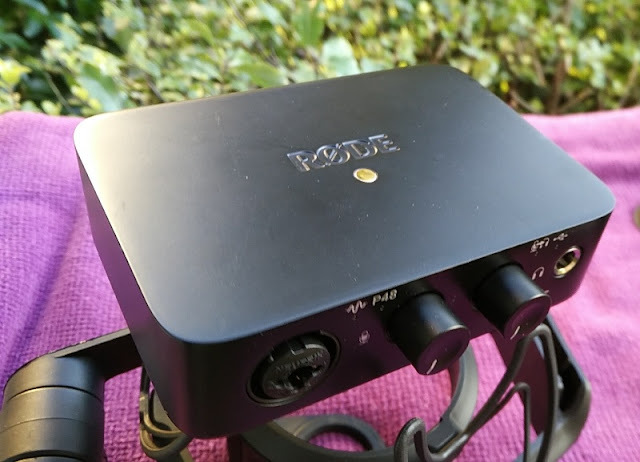 The headphone output on the Rode AI-1 audio interface has a total harmonic distortion of 1% with a maximum output of 210mW at 32 Ohms and 390mW at 300 Ohms. 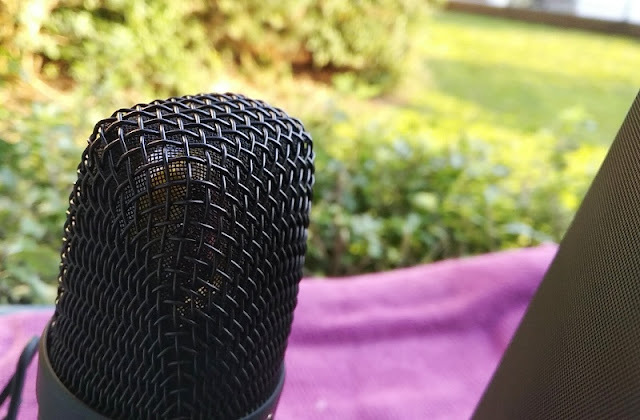 The NT1 is a side-address, pressure gradient microphone with a cardioid polar pattern and a built-in 1-inch condenser capsule with gold-plated membrane. 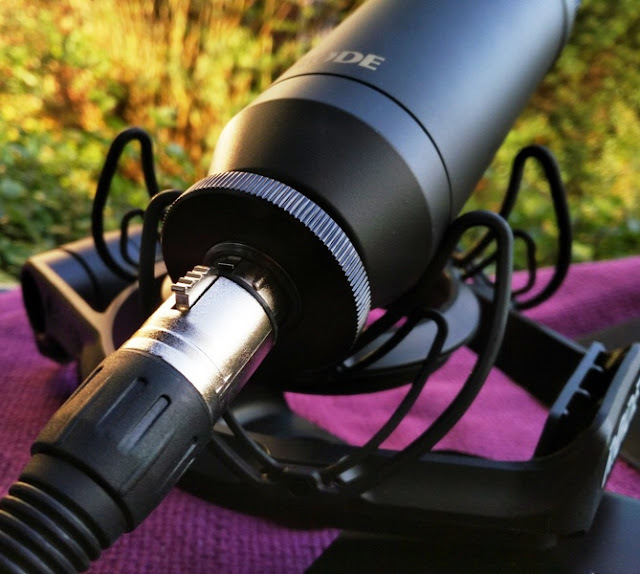 Being a side-addressed and pressure gradient microphone means that the NT1 mic capsule is pointing toward both sides of the mic membrane. 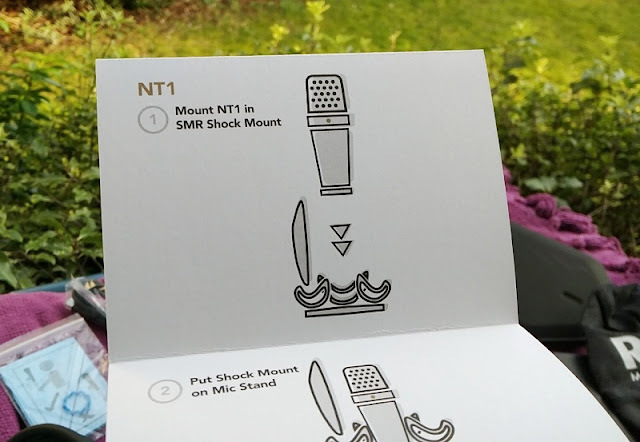 That means when recording with the NT1 microphone you must turn the sides of the microphone toward the sound source. 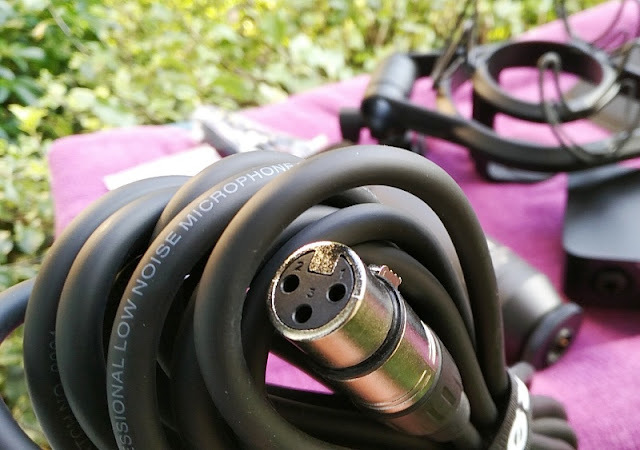 The frequency range of the NT1 microphone is between 20Hz and 20kHz with an output impedance of 100 ohms. 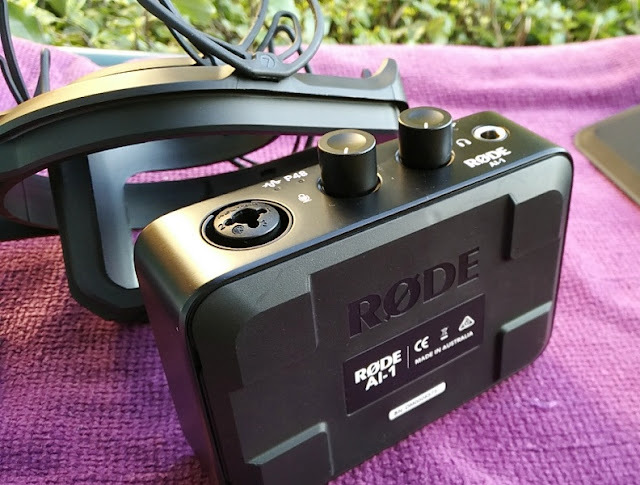 The maximum output level is 8.0mV with a sensitivity of -29.0dB. 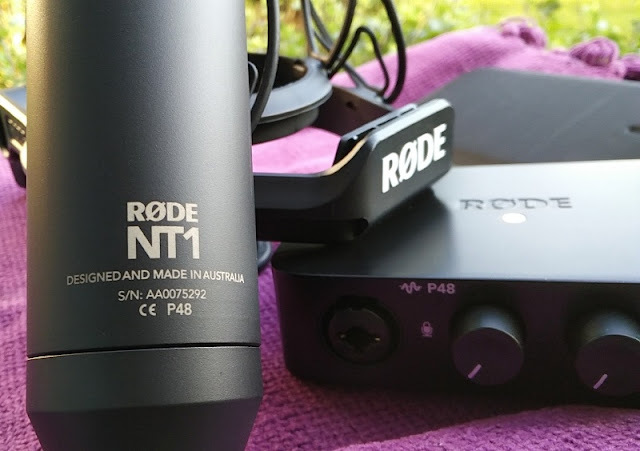 The NT1 mic weighs 440 grams, has a male XLR output and measures 18.7cm high, 5cm wide and 5cm deep, and also features an active preamp and a low-distortion buffer amplifier capable of handling bipolar signals. 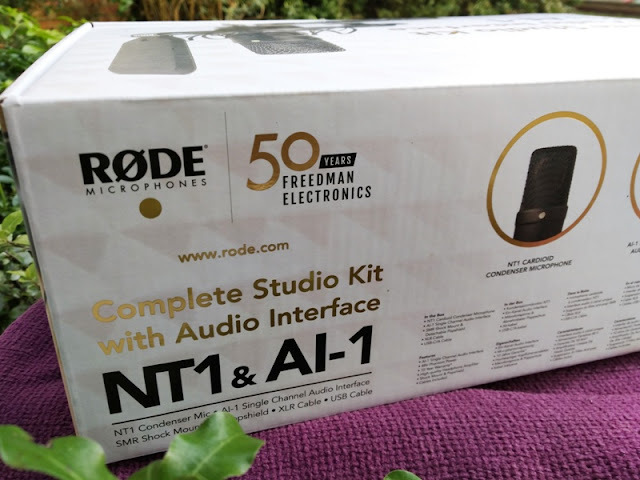 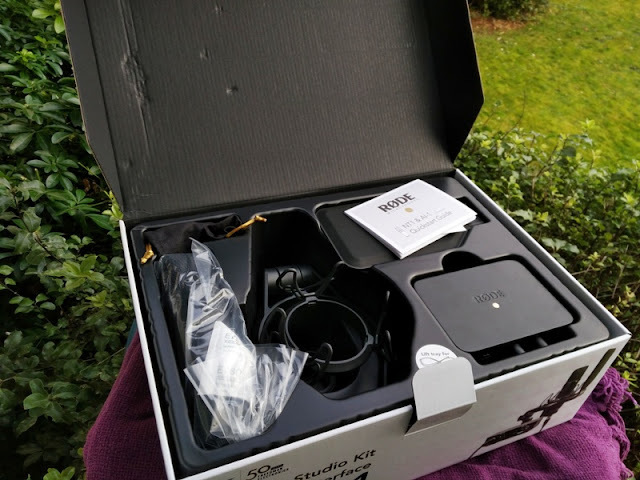 What's neat about the Rode complete studio kit is that it comes with everything you need to start using it right out of the box. 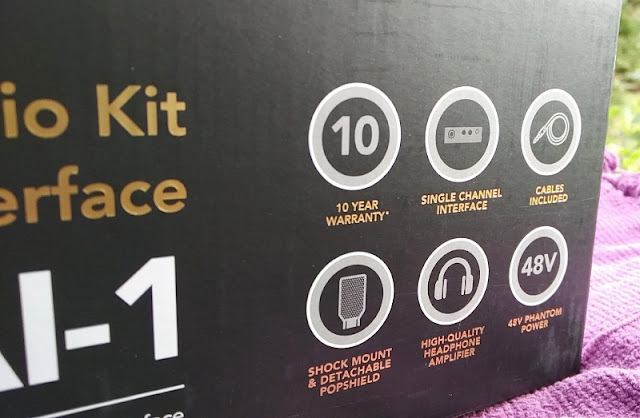 All you need to have already with you is a computer and a DAW software program. 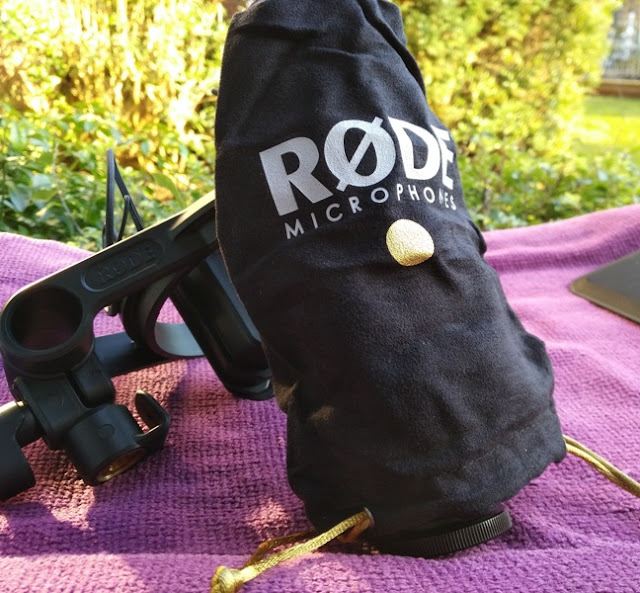 The Rode shockmount is made of reinforced polymer and fits most large diaphragm condenser microphones and features a clamping system and double Rycote Lyre suspension system that effectively suspends the microphone in total isolation. 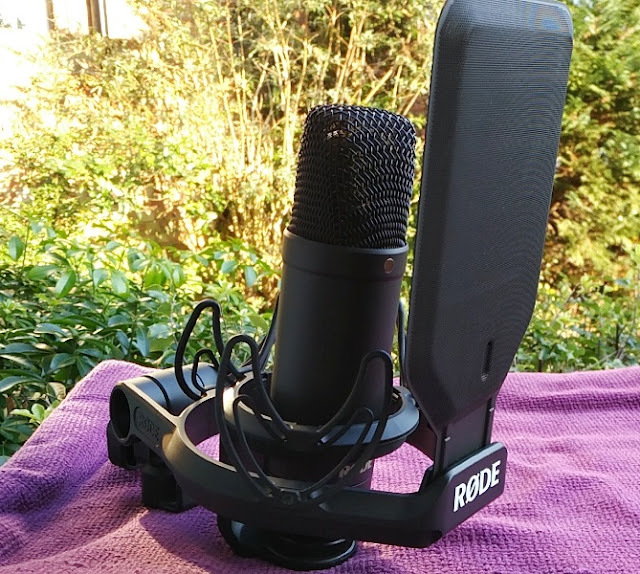 The shockount comes with a removable and washable all metal pop filter, a built-in cable management clip and a locking base nut to suit Rode large diaphragm condenser microphones. 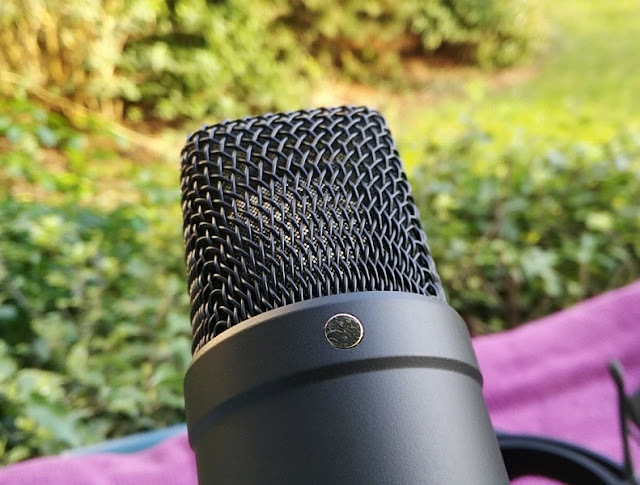 The wavy blue ring you see above is a spacer that fits inside of the mic. 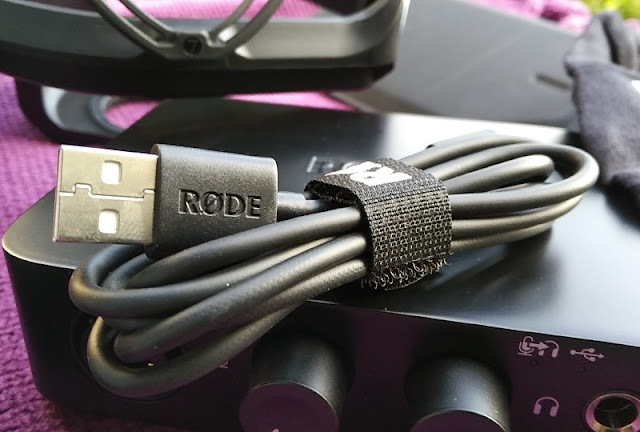 The ring is designed to give a more secure fit for the XLR cable to an XLR microphone.